Dedicated college counselors are available to help Elgin Academy students through the college application process. Not that long ago, getting into college was a relatively easy process. Most students looked for a college not too far from home, filled out one or two applications, took the ACT, and didn’t fret too much about getting into his or her college of choice. Today, the number of students applying to college has reached record levels, and the admissions rates of colleges and universities has dropped. On average, students now apply to eight to 10 schools, with many applying to 20 or more. 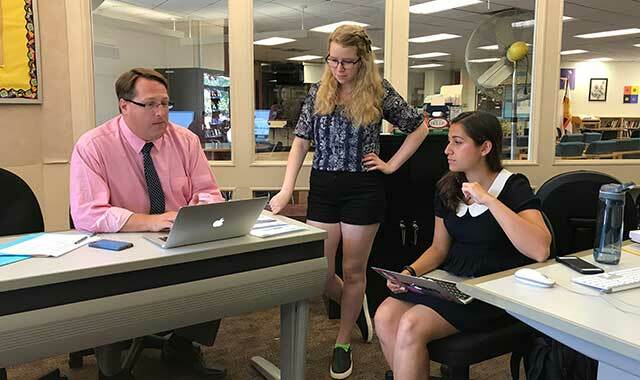 Helping students in a small-scale high school to manage the college process is a major focus for the faculty and staff at Elgin Academy, in Elgin. In the 2017-18 school year, two college counselors are providing individual attention to the school’s 32 seniors and their parents. An introduction to the college process begins in the freshmen year and continues with an ever-increasing emphasis into junior year, when things kick into high gear. From year to year, counselors assist students in putting together challenging schedules that are aligned with their interests and, when appropriate, include Honors and Advanced Placement courses. Because a student’s performance on the ACT and SAT can vary, students are encouraged to take both exams. In the fall term, college counselors take interested juniors on a bus trip to six or more Midwestern colleges ranging from big to small, public to private, and urban to rural. Students develop trusting relationships with the counselors as they travel together and share meals. Students learn what questions to ask when visiting with college admissions representatives and what to look for when visiting campuses. Because counselors get to know each student on a personal level, they are able to recommend schools that might fit best with each student’s needs and desires. Once senior year begins, Academy students are well prepared to begin the application process. Students are encouraged to create a list of safety, target and reach schools. Each application submitted by the registrar on the student’s behalf includes an official transcript, standardized test scores, honed student essays, and recommendation letters from counselors and faculty members who know the students and their families personally. College counselors are also available to help students and families through the often daunting financial aid application process and assist students in applying for merit-based scholarships. By and large, students are successful recipients of scholarships. The Class of 2017 was awarded more than $5 million in merit-based offers, and many graduates will attend college at a fraction of the advertised tuition rate. Careful preparation and planning can make applying to a college a great learning experience for students and their families. Elgin Academy graduates head off to colleges and universities all over the world as productive, conscientious and mindful young people. Elgin Academy is a Preschool through Grade 12 independent (private) school located on the hill in downtown Elgin. For more information, check out elginacademy.org or call (847) 695-0303. This entry was posted on Tuesday, September 12th, 2017 at 11:59 am	and is filed under Mind & Spirit. You can follow any responses to this entry through the RSS 2.0 feed. Both comments and pings are currently closed.